A community learning centre for the Semai Orang Asli in Kampung Tual near Raub, Pahang, run by Orang Asli teachers, is successfully educating children and the community, writes Suzanna Pillay. GRACING the walls of a classroom in the community learning centre for the Semai Orang Asli children in Kampung Tual are an assortment of colourful drawings. Their teacher Jenita Engi, an Orang Asli herself, tells me that drawing is something that her pupils love doing. "It allows them to express their points of view clearly," she said. Initially shy and reserved, the children warmed up and started interacting with me when I expressed interest in their drawings and what they liked to draw. Besides popular pastimes like football and catching fish, the yellow bespectacled minion character from "Despicable Me" was a favourite, too, among the children aged between 5 and 12. Jenita being interviewed by the NST reporter. But, the biggest revelation was that the children, through their drawings, were able to capture environmental issues facing the village such as deforestation and soil erosion which polluted their rivers. One pupil, when asked why he chose to depict his river as yellow, said it reflected the time when it rained once arid "sungai jadi kotor macam lukisan saya" (the river became dirty just like my drawing). who finished her Diploma in 'Early Childhood Education at Segi College. Jenita collecting cultural content for her teachings modules. "My lessons revolve around their families, their social life, and village environment and I teach my pupils according to their abilities, not to reach teaching targets. Some mainstream educators seem to have forgotten this principle of teaching." As to complaints that Orang Asli children are difficult to teach and discipline, Jenita claimed she had no problems disciplining her students as they listen to her and know that she is in charge. "Sometimes, I test their limits by pretending to be angry and ultra difficult to gauge their acceptance, but they still respect me as their teacher. "However, it is extremely hard for them to accept text, exams and work sheets and they can throw tantrums if made to do something that they cannot relate to their lifestyle." 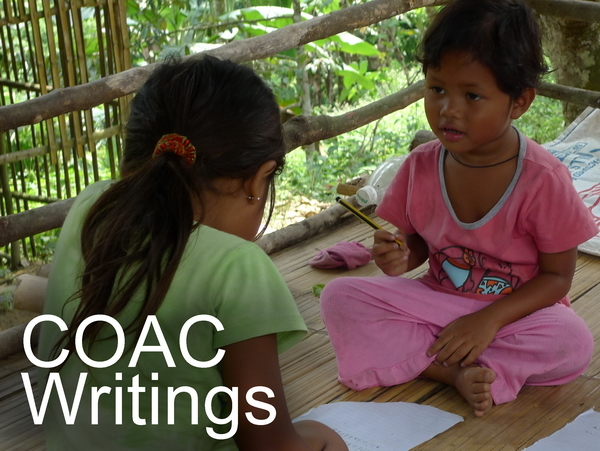 Orang Asli education is all about learning (not schooling) to become a useful Malaysian and also about becoming a member of the ethnic community' in this case, becoming a Semai. "And if a child wants to learn, there is a trust that first needs to be developed between all parties. 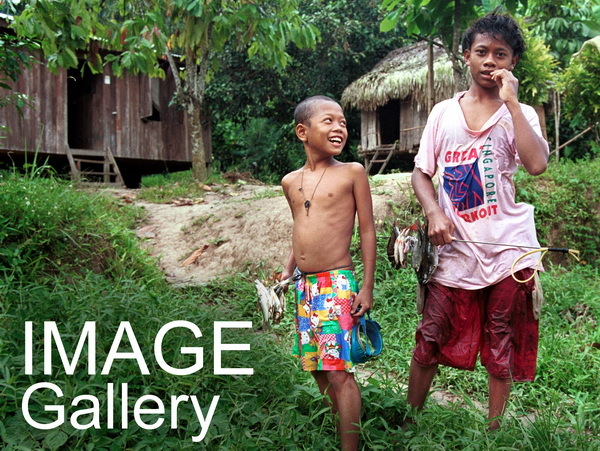 In the case of Orang Asli children, that trust can only come about if there is an element of security and familiarity. The project in Tual tries to provide both. And more," said Colin Nicholas, coordinator of the Centre for Orang' Asli Concerns (COAC), who together with Miwes Masital, another teacher at Kampung Tual, came up with the idea of the community centre. Nicholas said the centre is one of the largest, community-initiated and built traditional structures in any Orang Asli community. It is known as "Cenwaey Penaney", which means shoots of ingenuity in the Semai native tongue. The objective of the centre is not only to teach the Semai children, but to rekindle the cultural practices and customs of the community so that they are not forgotten. "It also serves as a multi-purpose community hall or Balai Adat, where gatherings, traditionalsewangs (dance) and community events such as kenduris (feasts) are held for the local Orang Asli community as well as those from other villages." The 120-foot wide and 60 feet deep structure was constructed by the community with most much of the materials sourced from the nearby forest. The villagers sourced the building materials from their surroundings, like timber beams for the structural frame, bamboo slats and strips for the floor and walls and rattan vines for lashings and bindings. "The project actually started in the beginning of last year without any firm funding. But we couldn't stop them as the community was eager to complete the building by September last year. "Fortunately, a couple of organisations had approached COAC wanting to know of deserving projects to fund. This resulted in crucial seed money from (the leftover funds of) Save Our Sungai (SOS) Selangor and the Rotary Club of Shah Alam. Friends who knew of the project then contributed, too. "We received donations in kind (food rations, crockery) from friends at Gethsemani Friary. And our Jaringan Orang Asal SeMalaysia (JOAS) partner in Sabah, Tonibung, donated a 3kw diesel generator." However, Nicholas added that the 'project still needed more funds and contributions to build additional facilities that would complete the centre. 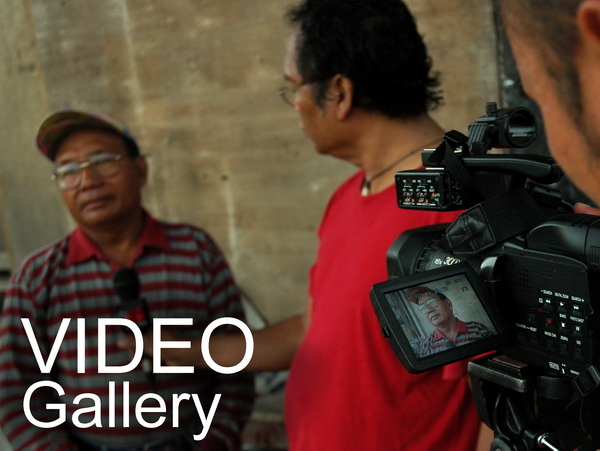 Like Jenita, Miwes who teaches Bahasa Malaysia and Maths to the children, completed his mainstream education and holds a Diploma in Broadcasting (from TV3) and a Degree in Film and Video from Akademi Seni Budaya dan Warisan Kebangsaan. "School attendance can be a little erratic during planting season and when the children follow their parents into the jungle to look for rattan. "Sometimes, we don't see them for a month, but they always come back for classes after that. They like the flexible teaching method adopted at the centre." Batin Harun a/ Siden, headman of KampungTual A, and Batin EK Cantan, headman of Kampung Tual B, said the children from their villages enjoyed going to classes at the community centre. The villages with a population of 6,000 have 166 children in the 7-12 age group, of which 100 attend regular school. The centre is a boon as it helps to educate the preschoolers and provides additional tutoring for the school goers. Kampung Tual only had one Tabika (preschool) for children between the ages of 4 and 6, which' is only able to take in 15 students at a time. When asked how the Tual children were faring in mainstream schools, both headmen said their younger children who did not have to stay in boarding school were faring alright because they could come home everyday but added that they needed more vehicles to take their children to school. "Presently, only one four wheel drive is able to take our children to school and when it broke down once, our children missed classes for two weeks," said Batin Harun. He said the older Tual children, who are in secondary school and forced to stay in hostels, did not like the arrangement and about half of them this year dropped out and preferred to work in their own village. Harun, who has two daughters staying in one of the school hostels in town, said that the schools should improve their communication with Orang Asli parents. Relating his own experience, he was upset that he was not allowed to see his children when he went to visit them recently bearing gifts of soap and clothing. "Like any .concerned parent, I wanted to see what their lodgings looked like and whether they were comfortable and happy there, especially after what happened in Pos Tohoi, but I was not allowed into the premises. Instead, my daughters had to meet me at the guardhouse of the hostel to collect the items from me." Not stupid. But eager to learn. 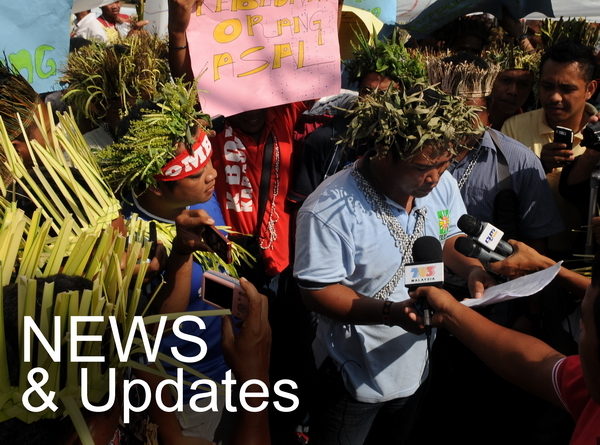 Batin Ek Cantan said that the punishment and disciplinary methods meted out on the children were unfair and not understood by the Orang Asli. He related an incident where some of their children were punished when a classmate stole a mobile phone and didn't own up to the deed. The entire class was punished for the theft. "Our custom in not the same. We only punish the person guilty of the crime. Why punish innocent children when there is only one person who is guilty?" Both headmen said their children complained that teachers regarded them as stupid, did not bother to teach and just came to their classes to "ambil gaji" (take their salary). "According to our children, they just write the lessons on the board without bothering to explain what it is about and then just leave the classroom. A good teacher should stay in class and explain what things mean to the pupils," said Batin Harun. Kiana, who cares for the younger siblings of the pre-schoolers, posing for the NST photographer.